Gluten-free muffins loaded with banana chunks, chocolate bits and walnut pieces surrounded in a creamy (dairy-free) muffin. Preheat oven to 400F and place muffin liners in 6 muffin cups. Set aside. Sift dry ingredients into wet ingredients and stir to combine. 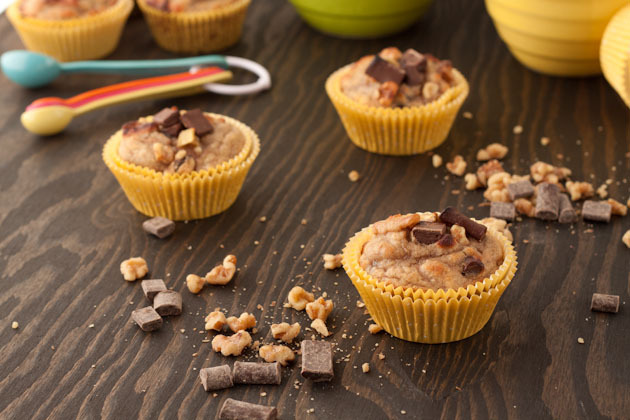 Mix in chocolate chunks, walnuts and banana chunks (be sure to save a couple of pieces of each for the topping for each muffin). Divide mixture into the 6 muffin liners and top with bits of extra add-ins. Bake for 15-17 minutes, or until toothpick inserted comes out clean. Allow to cool for 5 minutes in the tray before removing and placing on a cooling rack. 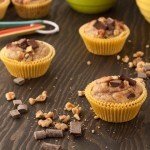 Reserve a couple pieces of chocolate, walnuts and banana for the topping of each muffin. I’ve never had much success in making coconut flour based recipes, vegan/egg-free. That’s not to say it wont work, I just can’t seem to master it… yet.